I liked the cover of this novel and I had ten minutes to spare. I picked this up and before I knew it I was reading it out loud and smiling the whole time. 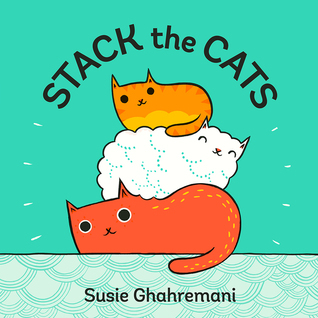 I give Stack the Cats by Susie Gahehremani five out of five hearts because it is a very cute childrens read that will teach them counting. Susie wrote this cute and easy to read book for teaching counting to children. The words are easy to read and form a funny rhyme. It is colourful and adorable. It makes me wish I had kids to read it too. Stack the Cats is best read out loud and with funny voices and the illustrations are beautiful and colourful. Please world, teach children to count with this funny little book, because it is going to interest the child way more than the boring school books. This entry was posted in Book Review and tagged Book Review, Learning, Nonfiction, Susie Ghahremani. Bookmark the permalink.